Digital rights group Fight for the Future has launched a “Corporate Scorecard” that grades more than 30 of the world’s largest technology companies based on their public positions on key U.S. policy questions affecting Internet users’ privacy and security. 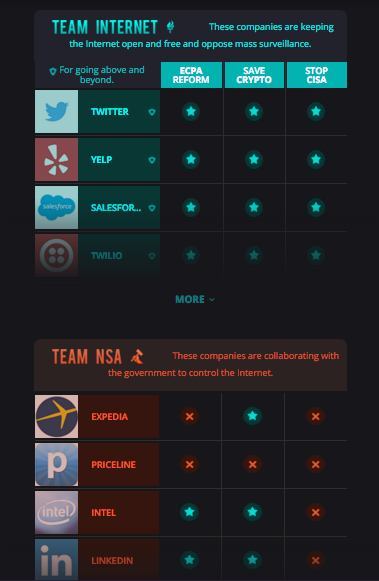 The scorecard divides companies into two groups, “Team Internet” and “Team NSA,” based on their stated positions. It grades companies on three current policy questions: Electronic Communications Privacy Act (ECPA) reform, support or opposition for government backdoors in encryption, and the Cybersecurity Information Sharing Act (CISA), which just hit the Senate floor last night. The scorecard shows that the majority of technology companies are aligned with their users in opposing policy that would lead to more government surveillance. 23 of the companies, for example, oppose CISA, including Google, Microsoft, Apple, Twitter, Yahoo, Yelp, Netflix, Amazon, Ebay, Wikipedia, and Dropbox. Apple and Dropbox joined this list yesterday, when they came out unequivocally against CISA. Internet Service Providers like Comcast, Verizon, and AT&T received among the worst scores, ending up on “Team NSA” along with companies like Xerox, Priceline, and Expedia. IBM, LinkedIn, HP, and Intel also ended up on “Team NSA” primarily due to their support for or silence on CISA. Fight for the Future has run multiple pressure campaigns in recent months calling on technology companies to take public positions on CISA. The Business Software Alliance (BSA), for example, had initially released a letter that appeared to support the bill, but quickly retracted that position after it sparked a public backlash and calls for boycotts. For more details on Fight for the Future’s recent campaigns around issues of user privacy and tech company accountability, see our press release from yesterday.